Every spear of grass--the frames, limbs, organs, of men and women, and all that concerns them, All these to me are unspeakably perfect miracles. I must have been infused by the spirit of Walt Whitman this summer. I’ve recently become fascinated by leaves. Although his collection of poems, Leaves of Grass is not about leaves at all, but about the joys and musings of being human, his “Poem of Perfect Miracles” resonates with me. Now we say goodbye to deciduous leaves here in the Northeast. Of course, we will continue to see evergreen leaves throughout winter. The noticeable differences between evergreen and deciduous leaves only scratch the surface of the marvelous diversity leaves display in nature. There are hairy leaves, huge leaves, tiny leaves, juicy leaves, leaves under water, leaves underground, leaves that are spines, leaves that make tree trunks, even flattened stems that look like and act like leaves. What’s more, most all share a common function – photosynthesis. So why in the world are there so many different leaves? Environment has a lot to do with it. This year I was fortunate to visit both Costa Rica and Hawaii. Banana “trees” grow in both places. I learned that the “trunk” of the banana plant is not woody at all. It is actually made up of a very dense collection of leaves compacted into a pseudostem or false stem making the banana plant the largest herbaceous flowering plant in the world – not a tree at all. Water, whether too much or too little, is a primary driving force for many differences in plant leaves. A pointed tip is common to leaves in the tropics. Called a drip edge, it ushers excess water off after plentiful and frequent rains. Many plant leaves in dryer areas have hairs, some to the point of being fuzzy. Some leaf hairs serve to dissuade munching insects. Other leaf hairs trap small quantities of water, reducing the humidity differential between the inside of the leaf and the outside environment. In Joshua Tree National Park where the Colorado Desert (a portion of the Sonoran Desert) meets the Mojave Desert, Teddy Bear Cactus, Hedgehog Cactus and other cacti abound. They are replete with spines, which are – you guessed it – extremely modified leaves. Spines arise from growth areas called areoles, a unique characteristic of the cactus family. Cacti don’t have leaves at all but carry out the job of photosynthesis through their massive succulent stems. Native only to the Mojave Desert is the weird and wonderful Joshua Tree. It is not a tree at all but rather the largest member of the Yucca genus. It does indeed have leaves: needle sharp, 5- to 9-inch long, stiff, fibrous icepick-shaped leaves. This “tree” is armed! Up on the top of the dry side of Haleakala on the island of Maui grows a beautiful silvery plant, native to Hawaii and endemic to Haleakala, called Silversword. Aptly named, I wonder why its leaves are not chloroplast-rich green. The roseate formation of leaves on this plant are perfectly adapted to its alpine desert environment. The leaves are spiky to keep most grazing herbivores at bay; fortified with a thick cuticle to prevent water loss; furry to catch drifting moisture from passing clouds; pointed upward to direct condensing moisture down to the base of the plant; and silver to reflect the intense heat-generating sunlight. Ingenious. Haleakala is one of the first National Parks to be enclosed by a fence in order to protect Silversword and other amazing plants from being nibbled by wild goats, rooted up by wild hogs, and trampled by cattle. On the island of Kauai I was introduced to the Koa tree. Humanity is the troublemaker here who, in seeking its exquisitely beautiful and useful wood and creating pastureland for cattle, has depleted the number of large Koa trees drastically. There are still youngsters around, but the huge mature specimens prized for dugout canoes are extremely rare. What I thought were sickle-shaped leaves are actually flattened branches, green with chloroplasts. Hundreds litter the floor below each tree. I found only one on such a tree sprouting petioles of tiny, oppositely arranged leaves. Apparently, the majority of the food-making is done by these tough, compressed leaf-like branches. I’ve also had occasion to take a few canoe trips back home on familiar territory. Here are leaves dealing with a problem opposite that facing desert plants – too much water. Since they are surrounded by water, submerged plants have no need for waxy cuticles that prevent desiccation, nor stomata through which gases are exchanged. Nutrients and gases diffuse directly into plant tissues from the surrounding waters. Terrestrial leaves sport stomata mainly on their lower surface in order to reduce loss of water vapor. In contrast, floating leaves, like white water lily and duckweed, have stomata primarily on the top surface where it is exposed to the air. Aquatic plant leaves also house large air spaces allowing the leaf to float on top of the water or hover near the surface where sunlight is readily available. No matter where they are found, plants develop leaves to meet the rigors of their particular environment. I invite you to contemplate these “unspeakably perfect miracles” on your frequent hikes outdoors. “Is it at 95 yet?” I ask. 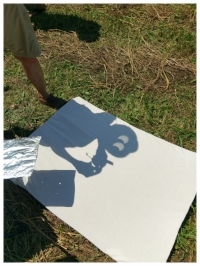 The Alabama college student peers through the sun-filtered reflecting telescope to estimate how much of the sun the moon has gobbled up. I look through the spotting scope fitted with a filter while others in the gathered crowd gaze skyward with nifty cardboard solar specs. “Yes, I’d say 95 percent,” he replies. Our surroundings have already taken on an ashen hue as if I am looking through gray-tinted sunglasses. “What’s the temp?” I ask, just out into the air, and a girl from Cincinnati steps under the tarp to check the thermometer. “Eighty five degrees” she chimes. “Eleven degrees less than when we started.” She bends to record it on the temperature chart. Her brother works the controls of the drone that is already in the air poised to record the moon’s shadow racing toward us from the west. Quavering shadow bands dance across the white sheet I taped over a large piece of cardboard, the earth’s atmosphere distorting the sun’s rays. Excitement fills our hilltop hay field band of observers. With totality imminent, I zip over to the crest of the hill just in time. “Look west everyone! Look west!” I cry, pointing to the fast encroaching darkness. Seconds later, a ghostly shadow envelops us. An orange sunset glows on the horizon from every point of the compass. Our crowd erupts into sounds of wonder and amazement. “Wow.” “Cool.” “Oh my god.” “Look!” I even hear myself: “oh my golly!” and “holy smokes!” or some such exclamations. I find it hard to describe the unexpected emotion that has overtaken me. I look back at the crowd to see daughter hugging father, husbands kissing wives, bewildered children looking around, a young girl crying. At this moment I don’t know what to do. The hours leading up to this point have preoccupied me with gazing through and adjusting telescopes, taking pictures, portraying images of the sun through my binoculars onto the sheet to make “cartoon eyes”, examining the towel by the trees to see the crescent shaped dapples of sunlight, taking temperature readings, and interacting with the assortment of people who have collected here for this fantastic event. Now, I just don’t know what to do. I trot over to the crowd around the scopes. As I do, I am intercepted. “Could you take a picture of us?” the man from Kentucky implores as he shoves his camera into my hands. “Hurry up everyone, there’s not much time,” he instructs his crew of about 13 kids and adults. They oblige immediately. I snap a quick picture and go over to the spotting scope. “I can’t see it in here,” the Michigan college student tells me. I stoop to adjust the scope but can’t get it in view. I don’t want to waste my time taking the filter off and fiddling. 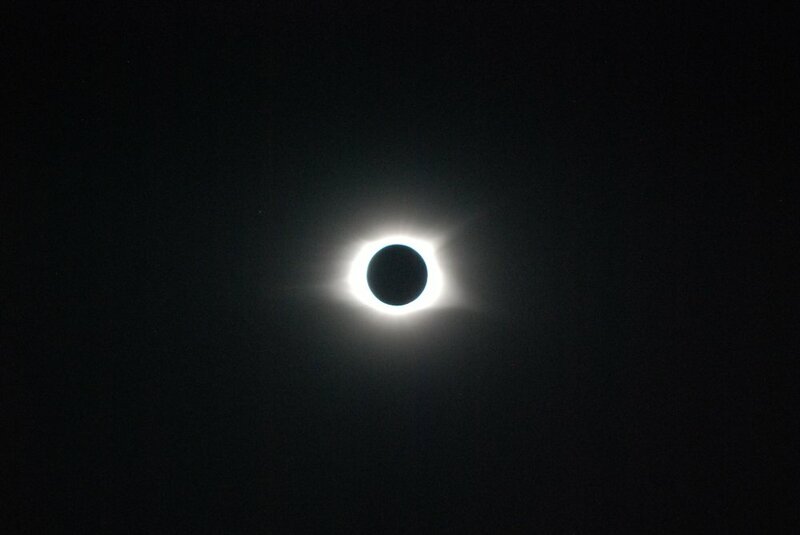 We only have two and a half minutes of totality. “I think this is just something we need to experience,” I explain. We gaze at the sun, unaided now, to behold the black pupil of a moon surrounded by a glowing bright iris of the sun’s corolla. My husband and the man from Ohio are discussing the identity of the planets now visible – Jupiter, Venus and they think they may see Mars faintly. In the world’s fastest two and a half minutes, the sun starts to reappear. “Here it comes,” I say to no one in particular. People put their glasses back on and we see the diamond ring effect. Our surroundings brighten. The magical moment has passed. “Now I get why the ancients were so frightened,” I overhear one of the Alabama college students share with his buddies. People are milling about, exchanging “that was amazing!” comments and marveling about what a spectacle the moon and sun showed us. Before long this band of strangers starts to disperse. A few kids and adults linger to peer through the telescopes, make shadow puppets on the sheet, and ask my science teacher husband questions. Basically, the show is over. The moon is revealing more and more of the sun behind it and the temperature will soon reverse its downward trend. We documented a 13-degree drop in all – from a scorching 96 degrees Fahrenheit to a respectable 83 degrees in the shade. Tents are dismantled and cars drive off to join the gridlock of eclipse viewers already clogging the highways. In talking with other malingerers, I learn this spectacle surprised many with its magical and unexpected emotional affect. It sure gripped me. Luckily, my husband had the presence of mind to get a photo from his tripod-mounted camera. I have nothing poor to say about our nation’s bird of choice, but I’ve got to admit intrigue and admiration of the wild turkey. I had occasion to visit relatives this past weekend whose home borders conservation area. The resident turkey flock is right at home on their back patio, taking advantage of the sunflower seed proffered them. By no means shy, this flock of toms (mature males) and jakes (immature males) allowed me a close-up inspection. Tom turkey plumage is tremendously iridescent. Green, gold, blue, bronze all shimmer in the sunlight all over their bodies, except for their red scaly legs and blue and red nearly-naked heads. The fleshy head must be visible because the hens need to see all the exciting protuberances and colors that are apparently so attractive. The bumps on the head and neck are called caruncles. The three large ones at the base of the neck get bigger when females are around. Showing red against blue flesh must be quite eye-catching to hens. The funniest facial appendage, I think, is the snood. It’s that fleshy knob on the forehead at the base of the beak. At this time of year it is a little knob, either drooping or erect. When the ladies come around, it becomes engorged with blood and dangles down over the bill. Hens seem to know that the best choice is he who has the longest snood! Don’t forget the wattle, or dewlap, that extends along the neck under the chin. This flap of skin changes color with a tom’s mood: blue with apprehension, pale with ease or illness and bright blood red during courtship. Then there’s the beard: a bundle of specialized feathers in the middle of the chest that look like hairs; short on young jakes but 9” long on an old tom. Finally I check out the spurs on the legs. As in roosters, toms use these as formidable weapons; jakes spurs grow as they age. An amazing amalgam of interesting parts (from my perspective) and appealing appendages (from the turkey hens’ perspective), the tom wild turkey is hard to ignore. It is a beautiful winter day. Our hike takes us right through a fallow field that just two months earlier was bordered by blazing yellow goldenrod. Now browned leaves droop from stems that sport an inflorescence of tiny fluffy seedheads on top. Something else catches the interest of my hiking companion. We look closer to find a ball-shaped swelling on the stem. “What is that?” she asks. Before I could answer, she points out another on a nearby plant. “This is a really interesting thing,” I begin. “It’s a gall.” Now I’m not sure how much she wants to hear about galls, but this manipulation of plants by animals just fascinates me, and I’ve studied and journaled and read about them over the years. There are over 2,000 kinds of galls found on North American plants alone. Each is made by a particular species of insect or mite or even nematode. Some are caused by bacteria or fungus. Some galls are good – like the bacteria within the root gall of leguminous plants that assist with the uptake of nitrogen. Some cause agricultural headaches. Most are benign. The gall itself is plant material that the gall maker has caused to grow providing food and shelter for the occupant. “This is a goldenrod ball gall,” I say. “It’s made by the picture-winged fly.” This is Eurostes solidagnis, also called goldenrod gall fly. Gall makers are very specific as to the type of plant they parasitize. In this case, the female goldenrod gall fly lays an egg in the stem of Solidago altissima in the spring. The egg hatches in ten days. The larvae bore down into the stem, giving off hormones from its saliva (auxin and cytokinins) which stimulate the plant into hyper-growth. This extra tissue forms the gall surrounding the larva in its chamber where it stays for a full year. The larva can also counteract the plant’s natural defenses. Jasmonic acid - another hormone - is often produced by plants in response to an herbivore’s attack. It can trigger the release of compounds that prevent the offending insect from digesting the protein it seeks from the plant, making the feeding on that plant moot. But the larva turns off this defensive mechanism. After a year, the larva pupates within the gall, and a few weeks later the adult emerges. They live only two weeks “on the outside” - enough time to mate and allow the females to lay eggs and begin the cycle all over again. “Here’s another one,” my little girl said, “and another one!” “This one has a big hole in it,” she noted as she plucked the stem. “Gee,” I said, taking it from her to examine, “Seems this larva got dug out of his gall by an enterprising bird – maybe a chickadee or woodpecker.” Getting an idea, I asked my young companion to collect a complete gall, which she promptly did. “Do you want to see what’s inside?” There was no doubt that this interested her. I took out my Swiss army knife, knelt down to use a thigh as a table, and carefully sliced through the gall tissue right down the middle. Prying the two pieces apart we found an inner chamber, inside of which was a tubby whitish little larva. “Ewww,” she said. First reaction. Wait for it… I put the larva in my hand. In a couple seconds she said, “Let me see.” There we go - curiosity trumping revulsion. We examined the little fellow for a minute before continuing on our hike. We soon found ourselves in a forest setting. Here she found another natural thing that interested her. “Look what I found,” she presented me with an oak twig with a brown golf-ball-sized growth. “What is this?” she asked. “Let’s break it open and see what’s in there.” She’s getting the hang of these galls now. The brown, crispy gall broke open quite easily to reveal an almost hollow cavity with radiating fibers. These filaments are the remnants of vessels that transported nutrients and water to and from the larvae that once nestled in a chamber in the center. “Look,” she exclaimed as she examined the interior of the gall more closely, “there’s a bug in here.” Sure enough, another little critter found the gall a convenient place to spend the winter, but its plans were foiled by our curiosity. On your hikes this winter, be on the lookout for galls of all sorts. They’ll be on leaves, stems, buds, and roots of woody plants, herbaceous plants, garden and agricultural plants. Hopefully your curiosity will overtake your revulsion and take a peek inside to discover the inhabitant. “My father used to tell me stories about how this river turned colors and stank to highheaven,” one fisherman said to the other. The two were standing calf-high in waders casting shad darts into the water teaming with American Shad. “No fish in its right mind wanted to be here,” he went on. “Hey Grandpa, I got one!” the younger fisherman shouted excitedly. “He’s really puttin’ up a fight.” The young boy worked the fish with a practiced hand, while his grandpa coached in a measured tone. “It’s a big one,” the gleeful boy announced as the shiny fish jumped and fought the line. The old man, having reeled in his line to help his grandson, gently scooped up the shad in a net as the boy drew it near. It is springtime and the anadromous fish are coming up the Connecticut River as they have since time immemorial. Sea lampreys, blueback herring, gizzard shad, are all coming up but the American shad far outnumber them. It is a beautiful May morning and the fishermen watch as four paddlers launch canoes and kayaks from the opposite bank. Grandpa goes back to his reminiscing. “And fishing!” the boy interjected. The Connecticut River was designated a “National Blueway” in May of 2012 as part of President Obama’s America’s Great Outdoors initiative. This designation recognizes the grassroots collaboration of over 40 organizations involved in advocating for a healthy and enjoyable watershed. These organizations are involved in land and habitat protection, river restoration, environmental education and enhancing recreational opportunities throughout the Connecticut river watershed. Today our river is and will remain the first and only “National Blueway.” The program dissolved in January of 2014. The Connecticut River today boasts an abundance of wildlife, a growing number of access points, numerous recreational opportunities such as swimming, boating, fishing and camping. A great example of these collaborative efforts is seen in the Connecticut River Paddlers’ Trail - a loose collection of organizations that work to establish primitive campsites and improve river access for paddlers all along the river’s 410-mile length. Another organization making great strides is the Connecticut River Watershed Council (CRWC). They advocate for clean water, fish passage, endangered species and education throughout the watershed. “I’m glad the water’s a lot cleaner,” the boy said as he cast his line out. “Oh, each dam where fish migrate has to provide a way for the fish to pass. This fishlift here upriver at the Holyoke Dam was the first on the Atlantic seaboard. Other dams further upriver have fish ladders. “That’s good. Hey I got another one!” The boy braces himself and tugs against the line. “That ain’t no Shad,” the old fisherman announces as the boy brings the fish closer. “Oh,” the fisher-boy voices concern. After a very rewarding day, the two fishermen tromp out of the water, head up to the truck and peel off their waders. The two fishermen hug. The fisher-boy hops into the passenger seat and the old man climbs in behind the wheel.